Recently I have been getting a spade of emails from my wife and our mutual friends inviting me to join up with this new social networking site hi5. However after speaking to my wife, she insisted that she never sent any invites, nor agreed to allow the site to send any. 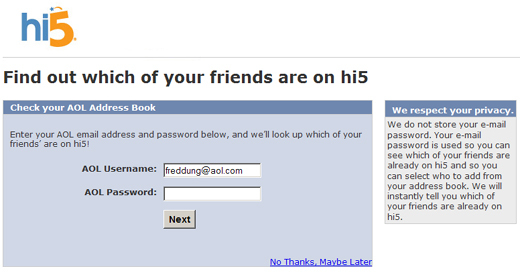 So I am wondering HOW THE HELL DID hi5 GET MY EMAIL ADDRESS? I had to investigate this issue and found out, with my wife’s help, that hi5 is “fooling” new members to supply their email addresses and password of their email accounts on the pretext to “Find out which of your friends are on hi5”. As you can see there is nothing in the fine print that indicates that invitations are to be sent. So what if they do not store the email addresses, it’s the misuse of the addresses that has irked me to no end. This is pure Bullshitaki. What they have done instead is to send invites to every person in your address book to join up hi5, and signing off as the unsuspecting new member. As you can see, this will become a chain event as each unsuspecting member sends invites to the next. The stupidity of the hi5 system is I even get multiple invites send to me by mutual friends resulting in a form of spam. Notice that they have manage to somehow send the email out from my wife’s yahoo account (maintaining the facade), and signing off as my wife (completing the facade) and making people believe that this was sent by my wife. This is totally unethical as the site in no way inform the user that this is what they would be doing. Furthermore the email signature that is sent to your friend has your name on it, implying that you gave consent and in fact wanted to invite them. The upsetting nature of this was it caused me to have an argument with my wife (you know the usual you should be more careful with passwords etc.) which was ultimately no fault of hers. Please pass the word around and do boycott this social networking site as much as possible. This incident just gives me a bad taste in my mouth. I get all sorts of spam from such sites because I made the mistake of giving my email address to those who are like your wife, unknowingly allows these sites to spam their address book. Strange thing is that they keep doing it! I have gotten crap from Hi5, Facebook, IMVU, wholivesnearyou. Irritating. The only thing I can do is to report those mails as spam in Gmail. Quite true. Other than putting it to spam there is not much we can do but spread the word and boycott. Wow, I’ve never heard of hi5, thanks for sharing. If I receive one of these at least I’ll be armed with the knowledge. I stumbled across your site on another where you were you were doing Technorati favs exchange, but couldn’t find your post for it. I would greatly appreciate if you would fav me as well.